St. Blaise was born in Sebastia in historical Armenia, now Sivas in Turkey. According to tradition, he was born from a noble family although we don`t know much about his life. What we do is that from being a healer of bodily ailments he became a physician of souls, and he retired for a time, by divine inspiration, to a cave where he remained in prayer. St. Blaise was Bishop of Sebastea and he instructed his people as much by his example as he did by his words, and he has many miracles attributed to him as from all areas people came flocking to him for the cure of bodily and spiritual ills. In 316, the governor of Cappodocia and Lesser Armenia, Agricolaus began a persecution of christians by the order of the Emperor Licinius and Saint Blaise was seized. He endured interrogation and a severe scourging before he was hurried off to prison where he was subsequently beheaded. 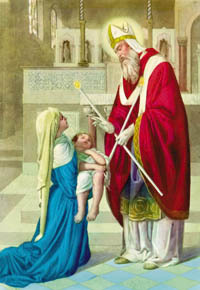 Consequently, Saint Blaise is invoked for his intercession and protection against illnesses and injuries of the throat. In many places around the world on the day of the Feast of St. Blaise (3rd Feb), the blessing of St. Blaise is given: two candles are consecrated, usually by prayer, these candles are then held in a crossed position by a priest and are either held over the heads of the faithful, or alternatively, the faithful are touched on the throat with them. At the same time the following blessing is given: “May Almighty God at the Intercession of St. Blaise, Bishop and Martyr, preserve you from infections of the throat and from all other afflictions”. Finally the priest makes the sign of the cross over the faithful.